It has been lovely crafting this afternoon with the windows thrown open and the sun shining in ... I really should be out working in the garden but I have been creating an outdoor scene for the Fussy & Fancy Challenge being hosted by the lovely talented Celine who has chosen Outdoors as her theme. I have long been a fan of Clarity stamps and recently Barbara Gray has introduced a great selection of stencils which make wonderful backgrounds ... I love the idea of starting with a blank white piece of card and turning it into a card using just a few stamps and some inks. 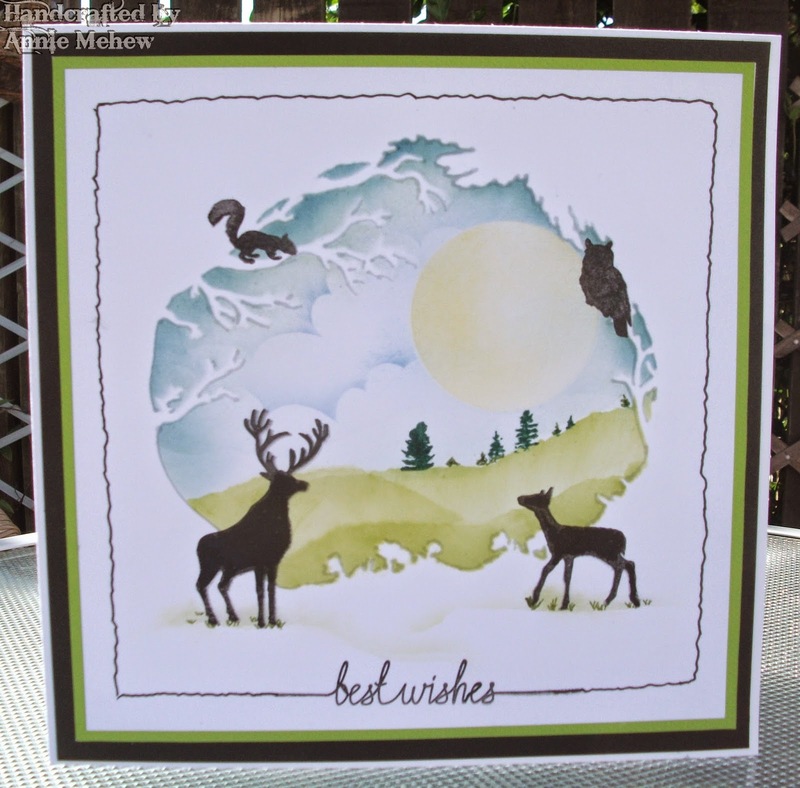 For this card I have used Clarity Woodland stencil and woodland animals stamp set and a selection of Adirondak inks. Over here in the UK we are lucky to have Barbara Gray on our tvs for 2 hours each month demonstrating with her Company's new products. I cannot draw or paint but having watched her over many years now I feel more confident about my cardmaking and stamping. She also has an amazing design team which includes our very own Jo Rice & Sam Crowe who are always an inspiration too. Right I think I ought to go and make a coffee for hubby who has been working hard titivating the garden, which I have to say is looking good after suffering the last Winter's storms. Hope you enter our new Challenge which is being sponsored this month by Crafty Sentiments. Just popped in to say "hello" Annie, I love the little scene you have created, the black silhouttes show up beautifully against your lovely background. Oh Annie this is such a wonderful scene!! You've captured the "Outdoors" perfectly!! Happy weekend Annie!! Absolutely love this card and the background is just wonderful. I've never used any Clarity Stamps stuff before but I'm going to go and have a look at them all now! You've totally inspired me! Such a wonderful card Annie! Black silhouette on a pretty background, is a stunning sigh! Very inspiring!